Amazon API Gateway and AWS Lambda empower developers to deliver a microservice architecture without managing infrastructure. Building scalable, secure, and durable applications has never been easier. However, managing the deployment of a large project is not always easy. A global app, deployed across multiple AWS regions in multiple environments will collect API Gateway resources, AWS Lambda functions, Amazon Identity and Access Management (IAM) roles and other AWS resources. As your project grows, so will the number of resources. The need to coordinate and organize your efforts quickly becomes apparent. In this post I will introduce JAWS, an open source application framework that you can use to develop massively scalable and complex apps using API Gateway and AWS Lambda whilst helping you manage your codebase and deployments. I will show you how to build a simple microservice that you can use to manage users for a sample application. You will build CRUD methods to support the management of users and persist details in Amazon DynamoDB. Project Name: Specify “userManagement” as value. Camel case is recommended here. JAWS uses AWS CloudFormation to deploy your project and some items use the project name. CloudFormation tokenizes the project name with hyphens so it is best to avoid adding any more. Project Domain: Use any domain you own. It is important to make this unique for your project. The project domain is used as part of the name for a new Amazon Simple Storage Service (Amazon S3) bucket. This Amazon S3 bucket is used to deploy your solution. Email Address for CloudWatch Alarms: Your email address. Stage: Specify “dev“. A stage is an environment, such as dev, UAT, or production. Each region can have multiple stages. You can easily add more stages after the project is created. Region: Any AWS region. The AWS region in which you will deploy your solution. You can add other regions after the project is created. Regardless of the region you pick, API Gateway will create a global Amazon CloudFront distribution for your project to provide your users with the lowest possible latency for their API requests. Profile: Your AWS profile. JAWS uses a profile in your AWS Command Line Interface credentials file (in ~/.aws/credentials) to make API calls. If you have multiple profiles defined, you can select the one to use. As it creates your project, the framework builds and runs a CloudFormation script containing some shared resources that are needed to support your project, such as IAM roles and the Amazon S3 bucket named after the project domain. The run command is good for simple testing but as your project grows, a unit test framework, such as Mocha, is recommended. Go into awsm.json in the create directory and find the apiGateway section. Update the Path to users and the Method to POST. This indicates to JAWS that it should create a users resource in API gateway with a POST method that is integrated to your AWS Lambda code. 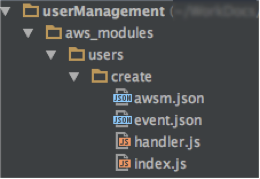 There are other settings in the awsm.json file to control how your project is deployed, although there is no need to change anything else at the moment. Use the arrow keys and enter to highlight both the endpoint and AWS Lambda function in yellow before navigating to deploy selected and pressing enter. Your code is then packaged, using Browserify and Minify to improve run-time efficiency, and zipped. This package is then uploaded to an S3 bucket. For each project, JAWS maintains two CloudFormation stacks. The first stack, containing shared resources, was deployed when you made the project. JAWS now creates a second stack that contains your new AWS Lambda function (the code in the S3 bucket is used as a source). Any additional AWS Lambda functions that you write are added to this stack. After this stack is deployed, JAWS creates the API Gateway resources and methods. "message": "You have created user Nick"
You can view more detailed logging from your AWS Lambda function in Amazon CloudWatch Logs. You’ve now created stub functions for the CREATE and GET methods. Hopefully you can see how this process can be used to make the UPDATE and DELETE methods to complete the set of CRUD functions. Its now time to replace your stub code with something more meaningful. JAWS updates the CloudFormation stack for your resources, creating a DynamoDB table (named users-dev) and updating the IAM role used by your AWS Lambda functions. The only remaining task is to inject this dependency into your AWS Lambda function, so it can find the location to write the data. You can use the recently released API Gateway stage variables for this, or you can use an environment variable in JAWS. Environment variables are set for each stage and region, allowing you to run the same code across multiple regions and environments and configure the code at runtime. In this case, for example, you can have a different users table for dev and production. JAWS maintains a file in S3 that contains the environment variables. You can now deploy your project again using the jaws dash command. Before packaging your code, JAWS pulls down the environment variables from S3 and includes them in your distribution. Its now a simple task to update the logic of your AWS Lambda functions to read and write from the DynamoDB table. After you finish building your sample app, you can tidy up by deleting the two CloudFormation stacks that JAWS created. 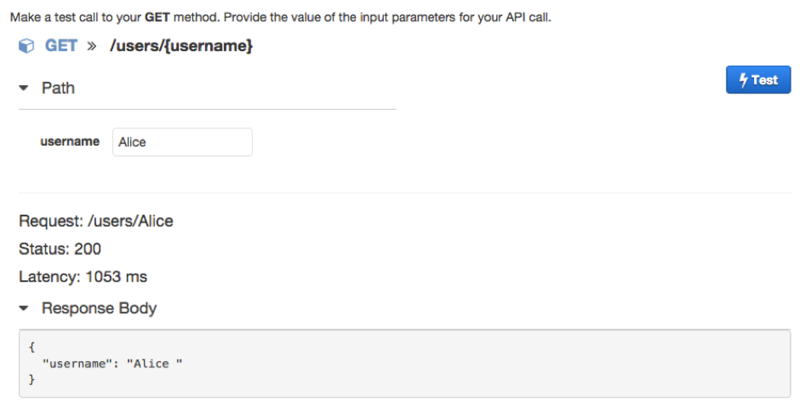 You also need to manually delete the userManagement-dev API from API Gateway. In this post I have shown you how to get started with JAWS, a framework for building microservices using API Gateway and AWS Lambda. As you build your project you can focus on producing exciting functionality since all of the infrastructure you need is fully managed. You can start to build your microservice application, leaving the heavy lifting to AWS and the organization of your project to JAWS.